Just wanted to say a big thanks for the birth workshop last weekend, we both really enjoyed it and hopefully now have some good techniques to get us through! Everyone was asked at the start what they wanted to get out of the session, this I think is really important and puts you in the frame of mind that you are turning up to get something out of it, and not just to tick a box. What I wanted to get out of it was to understand just how I could be as good a support for Kim as possible. It’s quite easy to accept that the man’s role is to sit on the sidelines getting your hand squeezed and voicing words of encouragement, but I wanted to do as much as possible to help Kim along the way. The joint breathing exercises were excellent, and I can say two births down the line that I was definitely able to help Kim regulate her breathing and keep her in control throughout her contractions.The massage techniques also proved useful. They were easy to follow and we starting using them straight after the lesson to give Kim some relief from the discomforts of the later stages of pregnancy as well as in the hospital ward. There’s also some good advice for knowing what you can and can’t do when in the hospital. I think without Claire’s wise words we would have gone with whatever the midwives had told us to do, but instead we were able to make some ellaborations to Kim’s birth plan and take felt more empowered when it came to the positions Kim felt most comfortable in when in labour. All in all I’d really recommend the couples yoga session. Not only is it a small sacrifice to make, you’ll also come out of it feeling a lot more informed and confident in your abilities to handle the events that lay ahead. Just to let you know that I’ve really been enjoying the classes and I would definitely like to sign up for 6 more when my first batch is up. I never thought I’d say it but I genuinely find a sense of inner calm from it so thanks so much for making it so easy for me to fit in. I started to go to Yogabright when I was 8 months pregnant.I couldn’t find a good pregnancy class in the area which was not ridiculously early on a Saturday, and was encouraged by my midwife who told me how good yoga was for preparing your for birth! I really enjoyed the lessons, and I do think in some part it did all help to prepare me for the birth of my daughter, who came much quicker than I ever anticipated! I have continued after this with Baby Yoga classes – I have so enjoyed meeting new mums in the sessions. The classes are always fun, and a lovely way to bond with your baby. The teacher Clare is really friendly and I couldn’t recommend her more highly. I started attending Claire’s Yogabright classes with the intention of keeping fit and learning some labour coping techniques. I found the classes informative and relaxed. We were able to ask questions or add input at any time which was helpful. Attending these classes helped greatly with my focus, fitness and feeling much more in control of my experience thanks to the breathing exercises and learning positions that helped greatly through my labour. It also meant I was able to let the midwives clearly know what I wanted and direct my own experience. I would recommend the Yogabright classes to anyone who is looking to gain confidence and helpful birthing techniques within a friendly and informative environment. This is a brilliant class taught by an excellent instructor. I highly recommend it. I attended Claire’s classes at the end of my second pregnancy. I found the classes to be really beneficial to coping with all the aches and pains in pregnancy and I loved being able to have time each week for myself and time to bond with my baby. I was particularly impressed with the way Claire tailors each session to meet the needs of the individuals in the group. I have has SPD in this pregnancy and have found that she has gone out of her way to research alternative exercises that are not just “fillers” but help me to manage the condition within my pregnancy. She also is excellent at explaining the benefits of the different postures, movements, and breathing techniques, for the purposes of coping with labour. I come away from each session feeling less achy, stronger and totally relaxed. Thanks Claire, you’re a gem! I attended Claire’s classes during my second pregnancy. It was fantastic preparation for labour and birth teaching me all I needed to know about breathing and the best positions for labour, all of which I used when the time came. It was also a lovely sociable class offering support, advice, laughter and relaxation which is a much needed tonic when you have a toddler at home and are the size of a house! I have absolutely loved your sessions, both before and with Eric, more so than I initially thought I would! The breathing techniques that I learnt in your sessions definitely helped me in labour with Eric and I would strongly recommend any mum to be or new mum to join your sessions. Thank you so much for everything. Claire is a very sensitive and nurturing baby yoga teacher who delights in sharing the joy of yoga with mums and babies of all ages. The special bond that is built between mum, baby and yoga teacher in pregnancy yoga, is continued with deep respect by Claire….the babies that know and love her from pregnancy yoga respond to her with recognition, enthusiasm and trust in baby yoga. I hope this encouraging to mums who wish to join baby yoga classes with their babies, and may not have experienced pregnancy yoga with Claire. Claire is a wonderful example of mothering with good consistent boundaries, and this comes through in her teaching, which is very helpful for mums who are learning to parent from the heart whilst also taking care of their own needs. I highly recommend her baby and postnatal yoga classes. After hearing the great feedback about Christina’s online classes, I was really excited to have the opportunity to experience the Junkies sequences. I was worried that it would be too advanced for me but I quickly found that I loved having the opportunity to try such a huge range of poses and to challenge myself to do the seemingly impossible! The fun and relaxed environment meant I felt that I could have a go at everything and it has massively increased my self confidence and practice as a result. More please Claire! Having been a student with Claire for several years I have truly loved the inner peace I go away with at the end of a class. 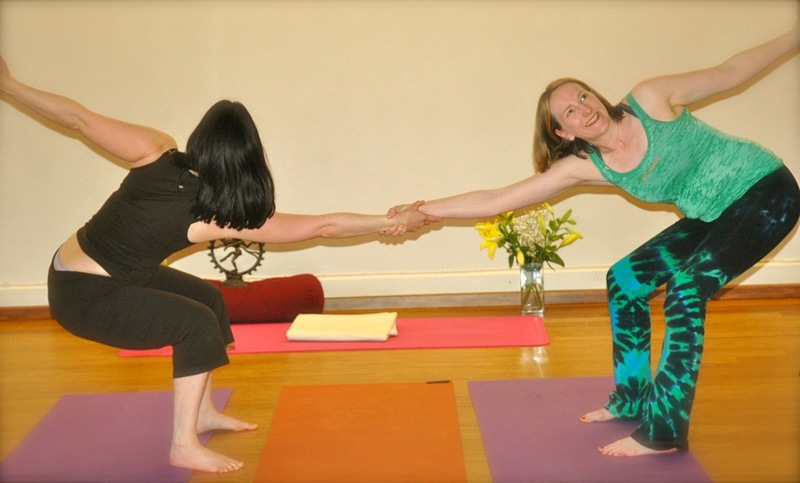 Claire always ensures a safe practice and teaches you about correct alignment so you learn more about your own body. The classes are fun and great for any level – always a sense of joining the community together which I love. If you’re looking for a dedicated, friendly and experienced teacher – I strongly recommend Claire! Wow thank you for today’s lesson my neck has been rejuvenated! Pain has gone I need you attached to me! I started Claire’s yoga class as a complete beginner recently and I have to admit I was not sure if I would enjoy yoga or not! However, after just a few weeks I was completely hooked. Claire’s classes have been absolutely fantastic, I feel loads stronger, more flexible and I have quickly gained my confidence with all the poses. What’s great is that Claire’s classes are always different and so we are always learning something new. Claire is brilliant at providing different options so you can work at whatever level you feel able and I always feel I have challenged myself. After Claire’s class I feel a little lighter and ready to take on the world! I totally recommend Claire, she is a brilliant yoga teacher. I have been going for 6 months and am continuing this year – Claire is an excellent teacher with well-prepared and structured classes catering for all levels. There are guest teachers on occasion providing variety. You can expect individual attention and can progress at your own pace – classes are always challenging and fun, and personally I always feel great afterwards! Thoroughly recommend … give it a try! Wow, Shakti Sistas are wonderful. Their Sweet Treats workshop was lovely – lots of moreish melting and I left feeling deliciously relaxed. Thank you Claire and Adele. Can’t wait for next time! Just got back from a workshop with Claire Saunders and Adele Cassidy’s Back care on the mat workshop. After a number of motorbike and parachuting accidents I had to have a disc removed from my back. I’ve been attending Claire’s yoga classes in Beckenham. Claire has helped get my spine mobile again. The class taught us some very good pain management tricks and ways to ensure we keep ourselves mobile. I hope they run this workshop again as I feel there is so much more I can learn. Claire and Adele made the class fun and ensured that everyone’s abilities were stretched along with some muscles I’ve never heard of let alone worked before! I would recommend this workshop to anyone who has back problems. I really enjoyed learning new perspectives on yoga asana and the stories. I loved your friendly, generous approach, thank you so much for coming. I really enjoyed the stories, adjustments, group and partner exercises. I felt enabled to do poses I don’t usually do! I really enjoyed the different style of practice and time away from my normal schedule. I really benefitted from the personal attention. Excellent teaching – inspirational. Enjoyed yoga asana, and my usual tears! Of joy and gratitude of course! Now feel 6 inches taller. Another class on Sunday pm! And Monday… And Tuesday.